Figure 2 Diagram of the extracellular domain of TNF-R1. In panel (a), brackets show the boundaries of individual CRDs, and modules of type A, B, and C are shown as red, blue, and gray, respectively. In panel (b), residues in CRD2 and CRD3 that bind to TNF-P are blue; residues that mediate parallel dimerization in the crystal structure of unliganded TNF-R1 are red. 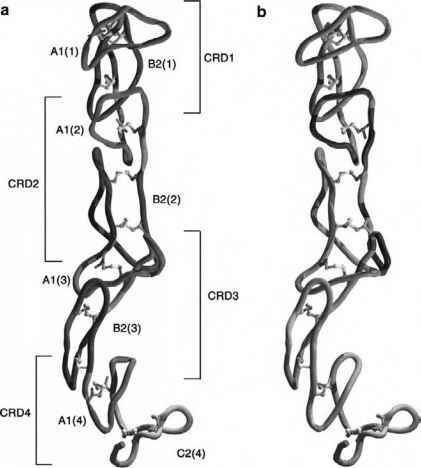 These residues are located in CRD1 and are located within the PLAD domain. The ECD is oriented with the N terminus of the molecule at the top of the diagram. the same trimeric molecule of TNF. The cytoplasmic domains of the three receptors are thus juxtaposed, although the mechanism by which they interact is yet unknown. The TNF-P-TNF-R1 interaction involves two separate contact regions (Fig. 2b) corresponding to the second and third CRDs of TNF-R1 which bind to protruding polypeptide loops of TNF-p. The recently determined structure of the TRAIL receptor bound to its ligand reveals a similar mechanism of engagement [18,19]. Complexes of other members of the TNF-R family with their ligands are likely to exhibit a similar mode of binding. However, the putative ligand (and receptor) binding regions of homologous receptors and ligands share no apparent sequence identity. This is true even of TNF-R1 and TNF-R2, which recognize the same ligands, and of TNF-a and TNF-P, which bind to the same receptors ; hence, the same binding surfaces must perform two different recognition functions. Human growth hormone receptor binds both prolactin and growth hormone, and the structures of its complexes with the two ligands reveals one solution to the dual specificity problem .